Even though we are located in Jupiter, FL, we aren't immune to the winter decorating bug. We love the sense of coziness that comes with the winter months and, regardless of the weather outside, we'd be darned if we didn’t decorate for the season! Part of the fun of living by the beach is that we can use these surroundings to inspire a different kind of holiday decor. The nearby beach can provide sustainable material that can be hand-crafted into beautiful holiday-themed pieces. 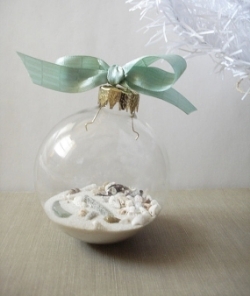 For example, here's a great idea for a Christmas tree ornament, that will bring the beach to your home. This simple DIY idea is an excellent way to get your family together for a fun project! Another idea is a beach-inspired wreath. All you need are a few decorative pieces from your local craft store, or your own backyard, and a visit to the beach to find starfish, shells and other fun additions. In Florida, not only do we have the beach, but we’re also lucky to have an abundance of fresh oranges available throughout the year. For many elsewhere in the world, oranges and other citrus fruit have become a staple of Christmas and the New Year, as that is the season they are widely available. So, it only makes sense that we use oranges in our winter decor. One great way of doing this is by adding them to your mantel along with fresh cut greenery. They’ll spice up your fireplace and are a natural way to give your space that clean citrus scent. If you do choose to go with a beach theme, remember that red and green aren't the only colors that can create a festive atmosphere. Play around with what looks good and bring the blue of the ocean in for a fresh take on the season! Copyright © 2015 Bandon Blue Designs. All rights reserved.